Complex Says: Let's see. In 2009, Hayden was qualifying on his Ducati at Qatar when he had a truly spectacular high-side accident that sent him flying through the air over the bike. Unsurprisingly, he suffered severe back and chest pain afterward and needed stitches, though nothing was broken. Despite the pain, he raced in the Grand Prix the following day, and placed 12th. In 2010, he chipped the radius bone in his left wrist during a fall while qualifying at Brno. Rather than sit out the race, he competed in pain, placing sixth and gaining valuable points for the championship. In 2011, he injured his right wrist during the Valencia Grand Prix, which luckily was the last race of the season. 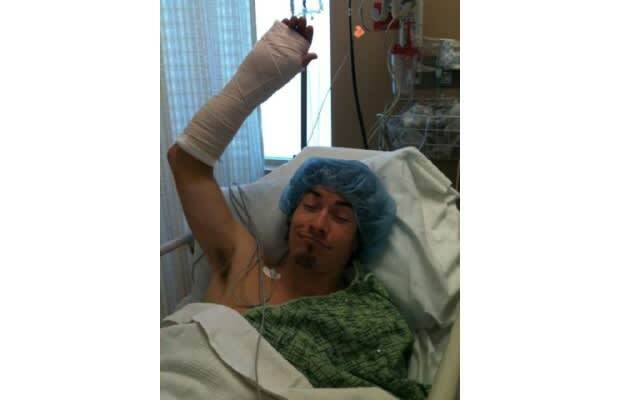 He's since had surgery to install a screw to hold the wrist together, and is planning to start the 2012 season on schedule with Ducati. If his record is anything to go by, we're sure he'll do it.